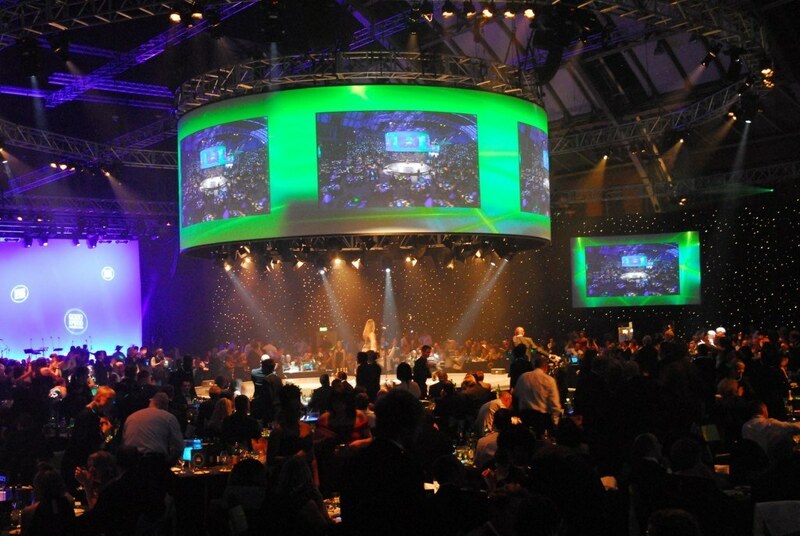 dbnAudile created a vibrant environment for the Co-operative's "Good with Food" Awards and gala dinner. 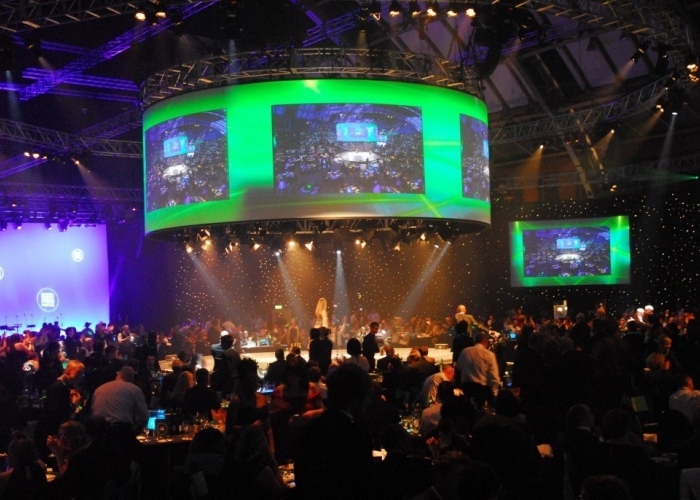 dbnAudile’s Pete Robinson was asked to create a vibrant environment, including scenic elements, as an ambient background to the 2009 Co-Operative “Good With Food” Awards and gala dinner, staged at Manchester Central (formally the GMEX). 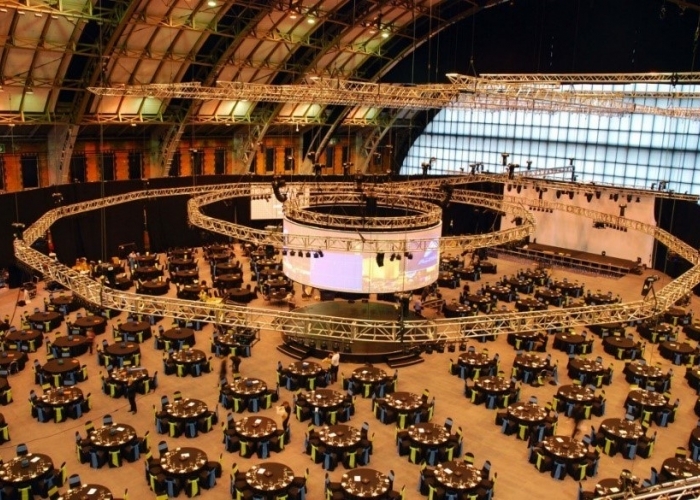 A 10 metre diameter circular stage in the middle of the room was the central point, with 150 tables arranged in concentric circles radiating outwards to the edges of the room. 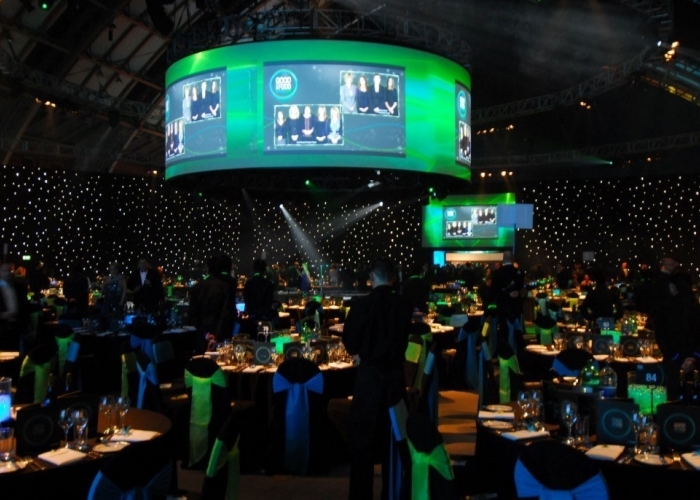 Above the stage was a cylindrical projection screen rigged by the dbnAudile crew on a 10 metre circular truss. 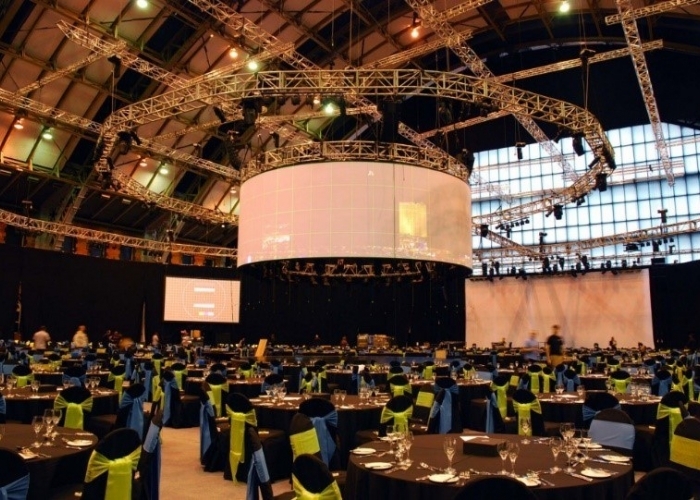 A 9 metre truss was flown inside of this providing stage lighting positions. Further out in the room were 2 more circular trusses measuring 21 and 38 metres. These, together with straight trusses above an entertainment stage at one end of the room, were used for lighting, video projection and PA positions. Another truss ran around the complete perimeter of the space, hung with a fibre optic starcloth. Robinson’s lighting rig had to illuminate the room generally and highlight the Awards action on the central stage and the live performances on the end stage. 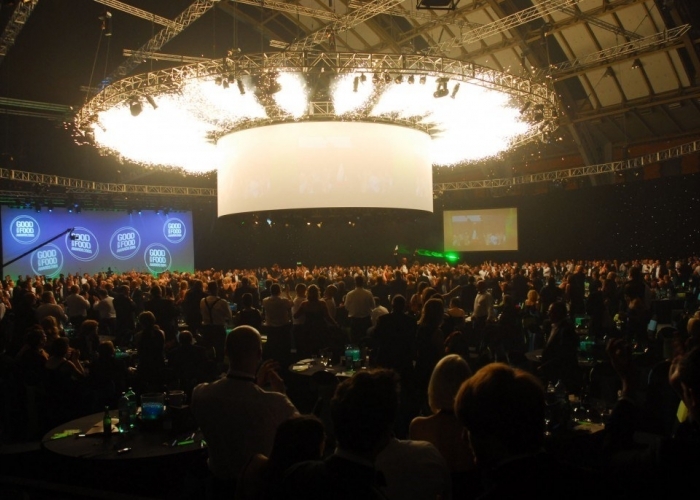 He used 60 Clay Paky Alpha Series moving lights in total, a mix of 24 Alpha Spot 575s over the central stage and Alpha Beam 300s, Alpha Spot 1200s and Alpha Wash 575s for the end stage and main space. Studio Due CS4 bars were used at the back of the end stage, which also featured an 18 metre rear cyc lit with ChromaQ ColorBlock 2 LED fixtures. A host of Source Four Profiles and ADB fresnels were dotted all over the room, and each of the 150 tables was individually lit with a single Source Four PAR. The starcloth was fed by Martin QFX fibre optic sources, enabling spectacular colour changes. The Co-Op has recently merged with Somerfield’s, so they were also able to do combinations and different looks mixing their respective corporate colours of blue and green. All lighting in the main area was controlled via a Jands Vista T2 console, operated by Andy Kennett. The dbnAudile team also created a totally separate drinks reception area in the hall with trussing and drapes, featuring a 40 metre cyc, lit with CityColors and some projection. This and other generic lighting was run from a second Vista T2. To connect the two areas and produce an aura of ‘anticipation’ as guests entered the main hall, Robinson created a 5 metre tunnel, which jumped into life with rear projections from ‘outside’ and lighting from more ColorBlocks and SGM PALCO LED floods. These effects were also controlled from the second lighting desk. The get in schedule was hectic, with 3 and a half truck’s worth of kit leaving dbnAudile’s premises in central Manchester, which was tipped at the venue on the Wednesday morning, with a rigged-and-ready deadline for the Thursday evening show. dbnAudile worked with 15 lighting crew on the in and the out plus 12 locals and a show crew of 8. Robinson also undertook some of the production management role. Co-ordinating the get in schedule was a major exercise to maximize the short get in time, and entailed ensuring that the different areas were clear to allow the assorted production elements like lighting, sound, staging and AV access to work in an efficient and logical manner. 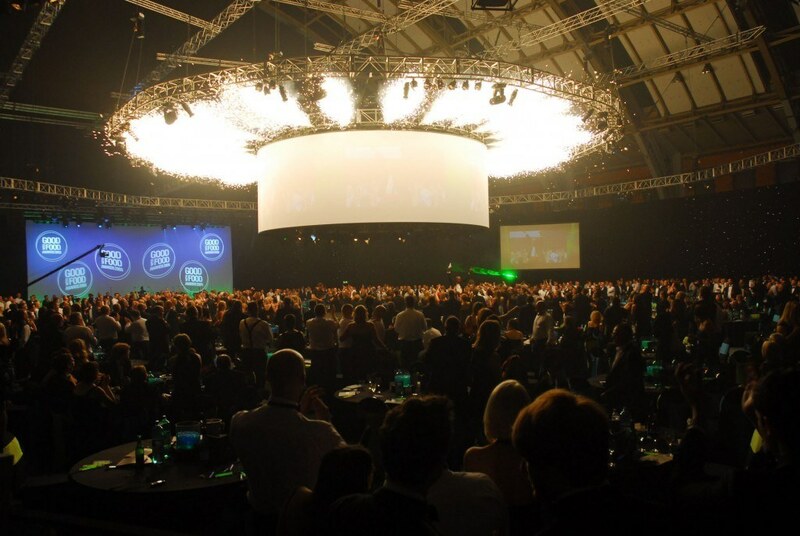 This was the latest event in dbnAudile’s ongoing working relationship with the Co-Op, for whom they have also done previous Awards shows and several other events at this venue.